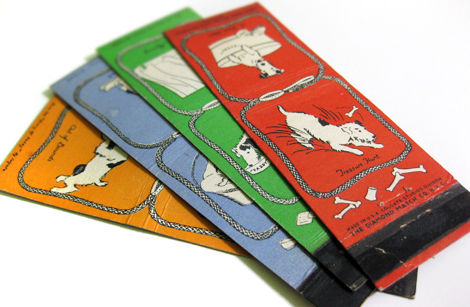 I happened upon a few albums of old matchbooks at an antique store recently and just couldn’t resist these sweet vintage dog images. So, into the studio with ol’ Mac, I created these fun free printables for you. Use them for digital designs, gift tags, labels, scrapbooking, Shrinky-Dink jewelry, party favors, quickie greeting cards, add to skewers for cupcake toppers, bunting pennants, or print to cotton to make little patches! Make extras to share (teacher gifts!) Click on the images for free PDF downloads. 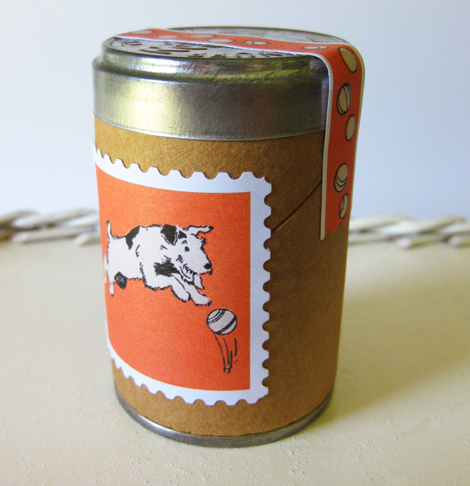 Print to full sheet label stock for making stamps and art tape. I designed one sheet with perforation dots to slice through and another with pups spaced out for trimming with postage-stamp-edge scissors or sewing the perforations. This entry was posted in Free digital collage sheets, Free digital downloads, Free PDF files, free vintage art, Paper Crafts, party favors, scrapbooking, Vintage Ephemera. Bookmark the permalink. You. Are. Awesome. These would be super for Father’s Day projects! You are amazing! I wish I had a pinch of your creativity!!! Thank you these are to to to cute. as always Cathe, you rock! Thanks so much! These are really fun! Thanks for sharing! They’re so wonderful! Thank you Cathe! My eldest daughter loves dogs, and envisioning incorporating these images in to her next birthday party! again thank you for your unstoppable cleverness and generosity. Beyond cute! Thanks so much for taking the time to share. Thanks again Cathe for the wonderful images! Love the little cardboard container. Cathe, is that something you have a source for? Would be interested in buying some of them. THANKS A LOT! It’s awfully nice of you. to share them with us. I love these, I don’t usually do cute or vintage but these are irresistible, Thanks. I have linked to these from my blog too. They are really cute! Thanks for sharing them. I think they would be perfect in a childrens room. They’re awesome, thanks for sharing! Cathe, you always have the greatest downloads – thanks a stack! How cute! Love the idea of shrinky dink jewelry! And I think I’ll use some to decorate a new treat jar for my Winston (not that he cares what the jar looks like, just what’s inside. LOL) Thank you! Cute Cute Cute – you are so talented Cathe. I am always so amazed at your creativity and graphics skills. Thanks for always giving us such wonderful freebies. These are fab-u-lous! I might have to go buy postage stamp scissors, just so I can print these out properly. Thank you, Cathe. These are so fun! These are adorable. I’ve got to get some postage stamp scissors–didn’t know there was such a thing. Thanks for sharing! Thank you for sharing these….they are so much fun! Okay, this is random, but I have to teach a lesson to the ladies in my church on Honesty and I’ve been wracking my brain as to the “handout.” I always head here first, looking at your vintage images. And when this dog popped up on my screen this morning–perfect! I like to always give something a little out of the ordinary to remind them of the message of the lesson. The idea of “clean-up” will be a great pairing with honesty. Thanks once again for coming to my rescue with your vintage images. I really appreciate them! Fabulous images Cathe…thanks so much for sharing! Totally darling! Makes me wish I had a color printer and a stack of sticker stock in front of me! These are adorable. I need some time to play. OH. MY. GOSH. These are so cute. Perfect for a card I want to make for a sick friend….he loves dogs and vintage stuff….thanks so much, you’re a sweetheart! awww! these are so cute! Thanks for the free download, these will be a lot of fun to craft with! Thanks so much! These images are fantastique! These are so cute! Thank you for all the great things that you post on your web site. You have no idea how much I enjoy it all! So are so great!! Love them, thank you!! These are the CUTEST IMAGES EVER!!! I love them and so thankful you shared them. You are so talented! aaaw sooo odorable and what a great idea’s you have with them!!! We’ve recently adopted a wonderful dog from the Humane Society so I’m going to have so much fun using these great images. Thank you so much…you’re always so generous! Thank you, thank you thank you! 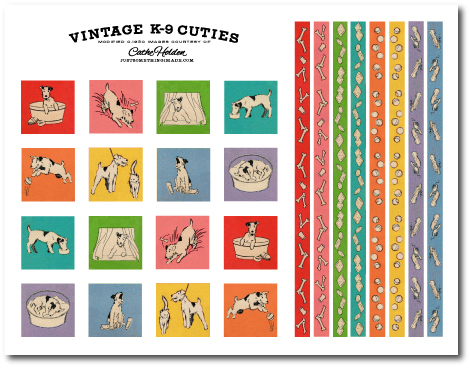 We have a wire haired fox terrier (wft), which is the type of dog in these fabulous graphics! Our wft is Ginger & we rescued her 2 years ago & she is just prescious. Thank you so much for sharing these darling images & all the wonderful creative energy you share w/the rest of the want to be creative people. 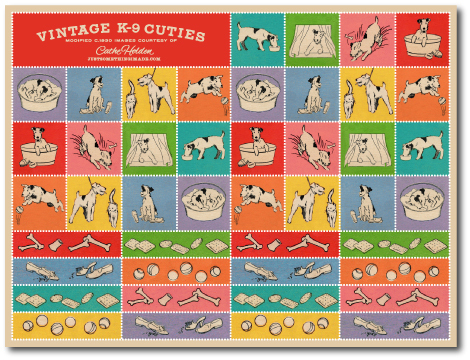 These are adorable, and instantly made me think of my rat terrier, Fred. They really capture his energy and enthusiasm. They’re going to make wonderful scrapbook page accents. Super cute!! You should make a cat one too! These are ADORABLE! This looks just like my friend’s dog Emma, and I have been racking my brain for a unique gift for her upcoming birthday. Don’t know what I will make yet, but am downloading these right now to play with. Thank you for always giving us such fun things! I could not download the 34 presized pdf images on the Country Living website for the shrinky dink bracelets and jewelry. Can you send me a better link for me to download? I really enjoy your blog and will continue perusing it once I finish writing this. These are THE cutest dog pictures I have ever seen! For some reason I have noticed recently that I am attracted to this particular dog (Jack Russell terrier?) and then seeing these images on your website/blog just sealed the deal for me! My next dog MUST look like this one! Thanks for providing your images freely–they are greatly appreciated! Love these cute little dogs! Especially the one in the tub! Thanks so much for sharing these! Now I just gotta find a project to use them on. these are FAb! Thank you! I am so glad I found you! Heard about your site through Paperclipping. Love the vintage dogs!!! Thanks for the free download. I just wanted to say thank you SO much for the lovely digital downloads. I’m sure I’ll have great fun with these in my design projects. What a lovelly lad you are for sharing. You’ve got a new fan! Would love these – but no images are appearing on the pdf. Help!! Oh Cathe these are darling! That little doggie looks just like my Harley the Wire Fox Terrier! Thank you for making these for us to play with! So sweet – thank you! 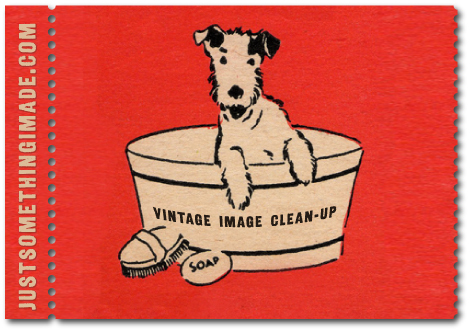 I collect old wire fox terrier magazine covers, ads, etc., because of my Reggie. Thanks so much for these! I love them, and will find many uses for them. What wonderful pictures. I’m a breeder and absolutely love this era. Many thanks for sharing these. Newly subscribed and highly enthused already! I am a Miniaturist and got the link to your website from one of my internet Dolls House Club members. I plan to use the K9 graphics to create some ‘Vintage’ Childrens’ books in 1/12th scale and maybe even smaller! Hope this is O.K.? These are great thank you so much I do lots of altered books, and scrapbooking, these will be wonderful, I have grandogs that need embellishment on their pages…..Thanks again. thank you so much for these. I love anything dogs. I have 2 and love them! Cute, cute cute! These are adorable! I train dogs and am looking for art to put on thank-you cards. Thanks for sharing. awwwww…..! these are so sweet! thank you so much for all the goodies!! Just became a huge fan! Thanks for so much fun stuff to look at! I am in no means crafty but am feeling inspired! I just stumbled across these gorgeous stamps. My daughters are going to have sooo much fun with them but… there seems to be a problem with the first image, when I try to download it I get a message saying insufficient data. We could still have fun with the second image but it would be great to have both! Thank you! Thank you so much! I love terriers and these are beautiful. AWESOME !!! Love my dog, card making, scrapbooking, shrink art !!! Love your creativity!! Love this vintage photo!! Would like to recreate it into a shower curtain any ideas on how?